The Republican answer to the DREAM Act—the Achieve Act—still falls short of what the GOP needs to win over voters. Republicans took some of their first tentative steps towards reinventing their party on Tuesday, when Senators Jon Kyl (R-AZ) and Kay Bailey Hutchison (R-TX) introduced an alternative to the DREAM Act. The bill, called the Achieve Act, would allow immigrants brought to the United States as children without documentation to stay in the country, but it would not provide a path to citizenship. Instead, recipients could apply for a series of visas, first to attend college or serve in the military, then to work. Unfortunately for Republicans, this measure—even if it became law—falls short of what the GOP needs to do if it is to win over growing electoral demographic groups. It won’t pass anyway. Hutchison and Kyl are both retiring and the bill is unlikely to be passed in the lame-duck Congress’s few remaining weeks. 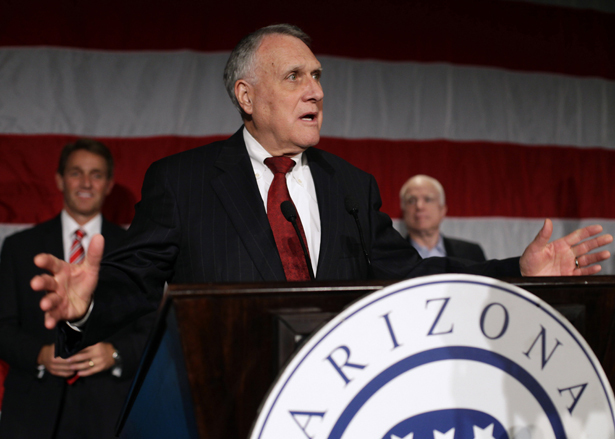 Kyl says that the bill will be moved forward by sympathizers in the GOP such as Senators John McCain (R-AZ) and Marco Rubio (R-TX), even though neither Rubio nor McCain has signed on as a cosponsor. Romney won many of the groups that are generally considered to be the ones to decide elections—Independents, white women (by double digits), middle income, and voters age 40+. Mitt Romney put together a coalition that just eight years ago would have won the presidential election…. So, if you win the swing groups but lose the election, that means the Democrats have a clear home field advantage. There are more Democrats. That underscores that we have to do better as a party with Hispanics. It will be hard to push white voter support for Democrats lower than 39% (which is all Obama got). Thus, to have a chance, Republicans have to appeal to Hispanics. It’s simple math, but it’s hard to do. We have to start today. Supporting immigration reform could also help Republicans soften their image among young voters. Obama dominated among voters 18–29 years old, winning them 60 to 36. According to the Pew Research Center, “In four of the key battleground states, Obama may not have won without the youth vote.” Only 58 percent of voters under 30 years old are non-Hispanic whites. Eighteen percent are Latino. But some conservatives question the inference that Republicans should try to woo Latinos. Last week Charles Murray of the American Enterprise Institute argued that Republicans are wrong to assume that Latinos are latent conservatives who will vote Republican as soon as the GOP embraces amnesty for undocumented immigrants. As Murray observes, the survey data does not show Latinos to be more conservative than the general public. I can understand why people think Latinos are natural conservatives. Just about every Latino with whom I come in contact is hard-working and competent. I don’t get into discussions with them about their families and religion, but they sure look like go-getting, family-values Americans to me. But note the caveat: “with whom I come in contact.” There’s a huge selection artifact embedded in that caveat—I always come in contact with Latinos because they are on a work crew that’s doing something at my house or office, or at my neighbors’ houses. That’s the way that almost all Anglos in the political chattering class come in contact with Latinos. Of course they look like model Americans. A party that is controlled by out-of-touch old white men like Murray is doomed to seem, at best, condescending to the minorities it hopes to attract. Like Charles Krauthammer, Murray throws around the term “family-oriented” without defining it, much less proving that it is true of the group in question. (Krauthammer was making the argument about Latinos that Murray finds unpersuasive.) Most irritatingly, Murray assumes, as Krauthammer does, that being “industrious, family-oriented, and self-reliant” should make one a conservative. Why is that? How does opposing health coverage for the unemployed encourage the industrious to leave her job and start a business? What exactly are the Republicans’ pro-family policies? Their opposition to federal funding for education and Head Start? Their desire to cut funding for children’s health insurance, housing and food? Those policies make it harder, not easier, to have children. What Murray presumably means to say is that he and his friends are not socially conservative. Republican elites often assert that their party is more cosmopolitan and tolerant than it actually is, because they and their cohort are. They’re in it for the tax cuts and the wars that poorer people’s children will fight. Well, good for them, but that has nothing to do with the views of most Republican voters or elected officials. Murray does not raise this point, but adopting a more moderate stance on immigration might help Republicans among Asian-Americans as much as among Latinos. Pundits often note the anti-immigrant California Proposition 187 as a watershed moment in turning Latinos against the GOP. It was also crucial in turning Asian-Americans off from Republicans. The problem, though, that Murray and other Republicans and conservatives are unwilling to address is that economic conservatism is as much to blame for their woes as immigration or social issues. Polls show that young people and non-white voters are more liberal on the role of government in the economy. But since economic royalism is the reason they are Republicans in the first place, conservative elites such as Murray cannot fathom actually moderating their stances on that. Until they do, though, they may find themselves unable to win over any of these demographics, stereotypes about entrepreneurialism and family-orientation notwithstanding. A group of Tea Partiers have another explanation for Mitt Romney’s loss: voter fraud.